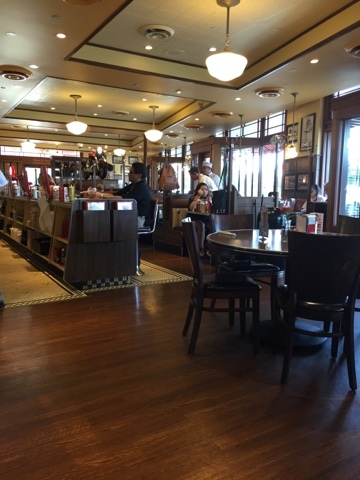 Ruby’s Diner was first opened in 1982 at the Balboa Pier in Newport Beach, California. Since then, Ruby’s Diner now has 48 locations in Southern California, Pennsylvania and Hawaii. They also have airport locations in Newark, Houston, Las Vegas and Los Angeles, and locations inside Anaheim’s Angels Stadium and Petco Park in San Diego. The Anaheim location is at 1128 West Lincoln Avenue, just north of Disneyland, right off the 5 freeway. They’re known for their burgers and handmade shakes, but they also have soups, sandwiches and comfort food items like pot pie and fish and chips. I was craving fried food, and met Karen for dinner on a Tuesday night. Apparently, Tuesday night is “Kids eat free” night, and we found plenty of families taking advantage of that promotion. 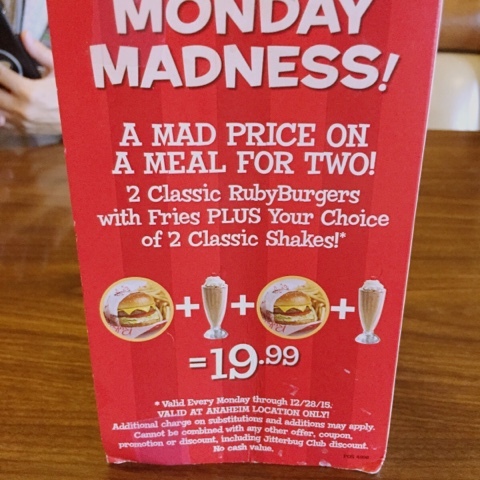 As we sat down, we saw a sign on the table telling us we were a day late on their Monday Madness promotion: 2 burgers, fries and a milkshakes for $19.99. Oh well, fortunately we were not craving for a burger. The host sat us in the rear of the restaurant, and later we figured out why. There were a lot of kids, and the host was kind enough to give us the more quieter part of the restaurant. The family portion of the restaurant was being entertained by the manager, as he provided magic tricks and other quirky entertainment to keep the kids happy. It really worked, as only 1 table had a child throw a temper tantrum. 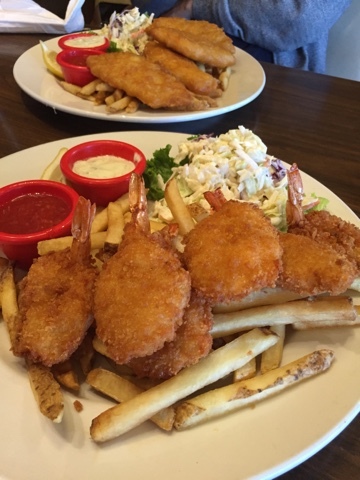 For dinner, Karen ordered the fish n chips, while I had the shrimp n chips. The food was good, but I have to admit that there are better fried seafood elsewhere. The price wasn’t bad, with the entrees about $12-$13 each. The seafood came out piping hot, while the fries were lukewarm. Fortunately, that kept me from eating all the fries, saving tons of calories. 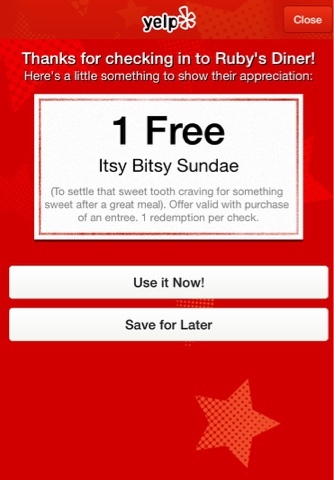 When we had sat down, I showed our server the Yelp check in special: a free itsy bitsy sundae. 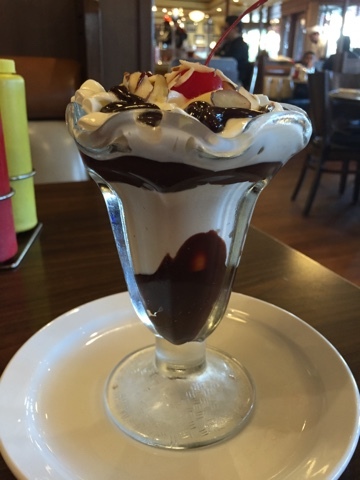 After we were done, the server asked us what kind of sundae we wanted (we only got 1 free sundae) and I chose the hot fudge sundae, thinking it was well, itsy bitsy. It was a full size sundae, enough for 1 hungry person, or 2 light eaters. I was quite amazed it came with everything: a generous scoop of vanilla ice cream drowning in hot fudge, topped with nuts (almonds, I believe), whipped cream and a cherry. The location is easy to find, and plenty of free parking. From the outside, it looked like it was supposed to be a car hop, but I’ve yet to see anyone roller skate. The parking lot at night is a bit dark, and many locals use the parking lot to cut across to the adjacent street. The location serves breakfast, lunch and dinner, and service can be slow at times. On this visit, we were lucky and had decent service, until we paid the check, and the service disappeared.